The Rainbow Bridge is described as a happy afterlife for pets that have passed on. The Rainbow Bridge poem has different variations but is often written in the form of a prose poem. The exact author and origins of the poem are unknown. Several versions of the poem have been around for decades. The poem has spread widely on the Internet. Our pets have short lives and most humans have experienced the sad loss of a dog, cat or other beloved pet. The poem inspires hope that we will one day see our favorite pets again. There are different version of the poem but the concept behind the poems is the same. The poem tells of pets waiting peacefully for their owners in Rainbow Bridge. They are happy in the Rainbow Bridge and play with the other pets. When their human dies and arrives in heaven the pet sees their human and runs toward them. "When a beloved pet dies, the pet goes to this place. Those who were sick, hurt or in pain are made whole again." "You have been spotted, and when you and your special friend finally meet, you cling together in joyous reunion, never to be parted again." 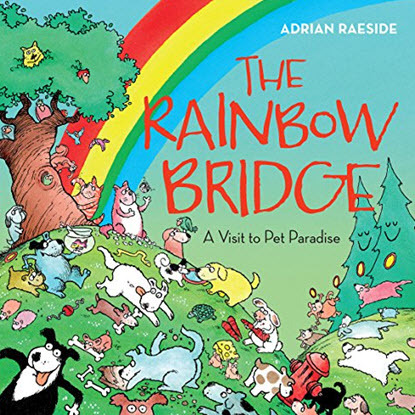 In The Rainbow Bridge: A Visit to Pet Paradise by Adrian Raeside (Harbour, 2012) the Rainbow Bridge is described as a "place where cats burrow through fields of catnip, no couch is off-limits to dogs and frisbees are flung endlessly." The Washington Post reports that poem helped launched the pet bereavement movement. It says the Rainbow Bridge is a "mythical overpass said to connect heaven and Earth — and, more to the point, a spot where grieving pet owners reunite for good with their departed furry friends." The Post article notes that the poem has fuzzy origins. A Wikipedia entry for the poem lists three possible original sources for the poem and says it was written as early as the 1980s. The Wikipedia entry also says the earliest appearance of the poem is on the newsgroup rec.pets.dogs in January 7, 1993 in a post that quotes the poem from an issue of the "Mid-Atlantic Great Dane Rescue League Newsletter." Here is a tribute video from Great Lakes Pet Memorial. They set the poem to music and added photographs of pets playing and running in fields. The video also contains the text of the poem.